My guy was licking on spot excessively and started a hot spot so I started my protocol but changed it up a bit and this may help others with small beginnings of a hot spot. My guy lets me handle him any where on his body but won't stand still for the power razors so I use to use scissors to cut the fur. this time is used a hand held cheepo razor and he was perfectly fine with that. Fwiw, just throwing it out here. GatorBytes and dogma13 like this. 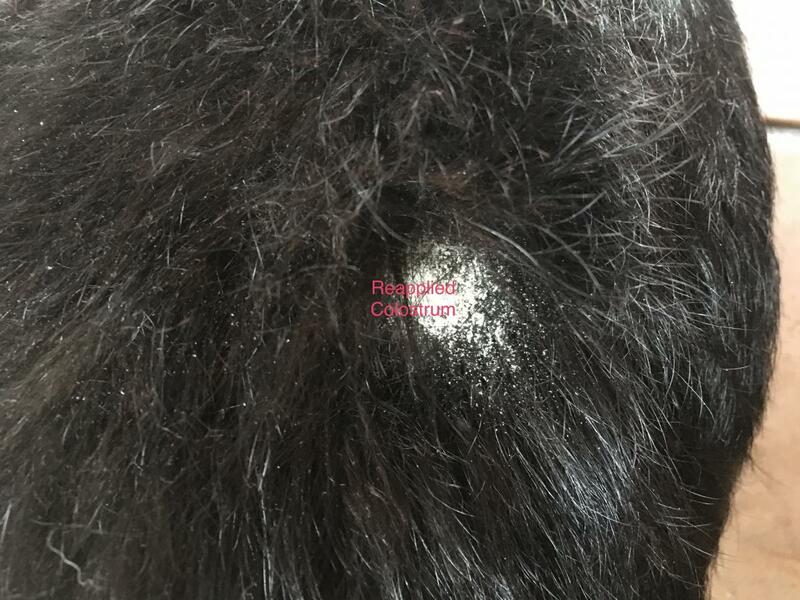 I don't know about colostrum, but last summer I treated my dog's hot spot with a combination of antibiotics (from the vet), Keto-C anti-fungal/anti-microbial shampoo and daily soaks with a very weak solution of potassium permanganate. I too use scissors for trimming. I don't think it is necessary or even advisable to shave the fur all the way off. It just needs air. Her hotspot healed quickly with this regime. 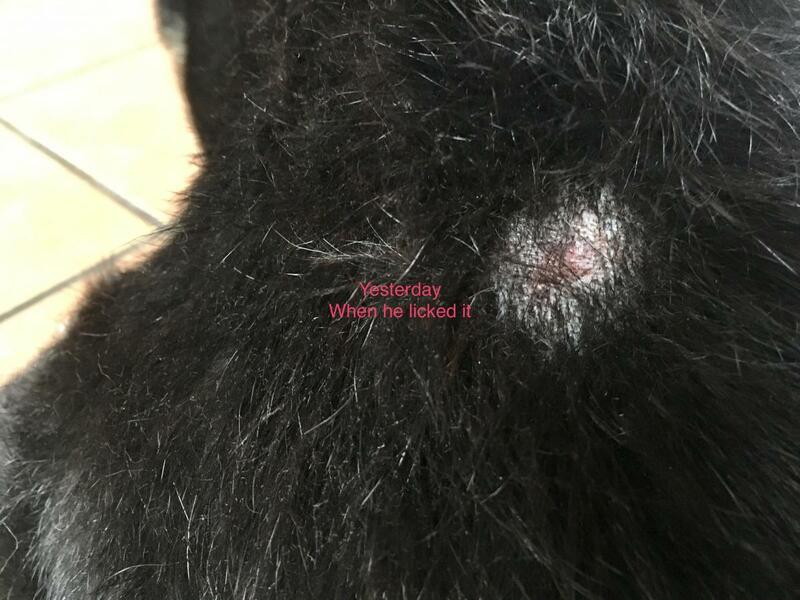 I wish I had chronicled with pictures from the beginning because when this started, the hot spot was angry looking and weeping and his itching at it was pretty bad. Before using the colostrum, I did shave just the reddened weeping area about a nickel in size (so the whole shaved area was affected) and I spot washed it with Hibiclens. Every other washing was just with clean water, drying and reapplication of the colostrum. What I find amazing is that this time the healing of the skin seems to have bypassed the scabbing phase and went right to rejuvenation of new skin. 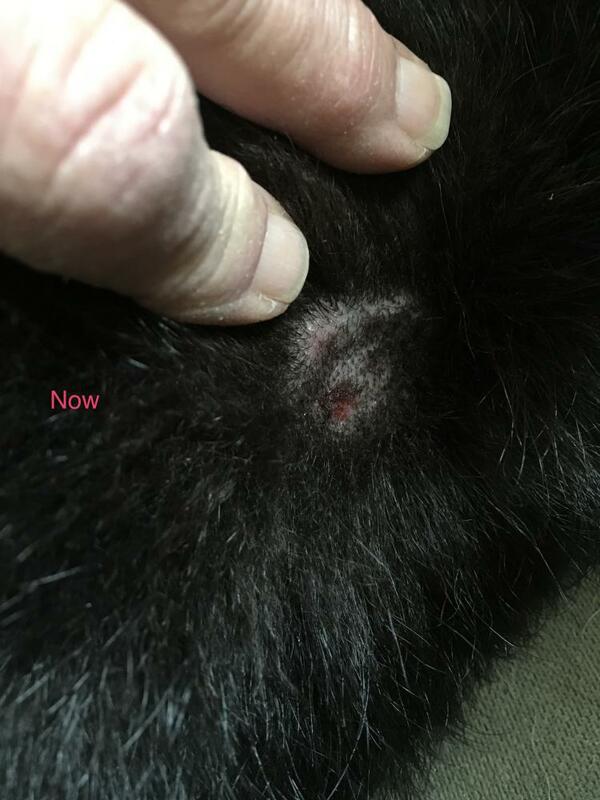 Every other time that I have dealt with hot spots Allopathically (vet involved) and previous self protocol, there has always been a scabbing/crusty phase. This mornings pic is what I woke up to as he did not wear his cone last night and licked the colostrum clean. That's my index fingernail in the pic for size reference and I am very pleased with the results. Everyone has their own protocol but I thought this was worth posting for those who are interested. Also, I do want to say that Im not against the use of antibiotics or traditional meds (even though I don't like them) so if I can minimize the number of times in his life that he needs them and save it for when it's absolutely necessary and it has been due to Lymes disease then for us that's a good thing. Thanks for sharing about the colostrom. I was not familiar with it as a topical for dogs. It looks like your strategy is working fine. 3 Attachment(s) Go to first new post Errrrmagod! Go to first new post CBD oil for Anxiety?